It's been awhile since a real update - and there has been a lot of family traffic since mom and dad (aka Grandma Gloria and Grandpa Bob) sent out their "Christmas letter" recently - so I guess it's about time. Last weekend was Easter and Radley became an egg hunting pro. During the week at daycare the kids had a special hunt. 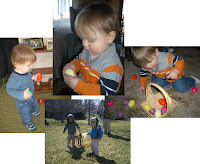 On Friday we went to Alexandria to Great-Grandmas where Tyler hid dozens of plastic eggs for all of us to find. Saturday was at Grandma Gloria and Grandpa Bob's - We never did find that last egg. And Sunday afternoon with the Grandma Sharlene, Papa John and the rest of the crew of cousins and second cousins. By the last hunt Radley was walking with a basket, finding the eggs and putting them in - a real pro. He wasn't as fast as his cousin Khalen though, so Khalen snuck a few into Radley's basket to make it more even. The big news this week was "Bye-bye, Dada" which happened on Monday morning when Davin left for work. Luckily I got a "bye-bye, Mama" the next day as I was leaving for string rehearsal, so I didn't have to feel too left out. We are also getting into the fun world of pretend play. Radley has made his cars drive with sound effects, and his animals "walk" and "kiss" each other. But this week he has been "feeding" things. The best for this is his big duck with the open bill. Yesterday was a beautiful day to be outside. We walked to the library - where we saw a few of our neighbors. Then we broke out the bikes and the kid trailer. Radley is finally big enough to ride safely in it. He even has a little helmet with squashed bugs on it (sorry, no picture). He had a great time riding, and even told us to "go" when we had to stop for traffic. Radley and I did a lot of walking last summer - he was too little for the trailer then. I am excited for some biking this summer on our fabulous greenway system. The following may be more info that you wanted to know about our water heater (or any water heater) We recently invested in a fancy-schmancy water heater when our last one died. It's a tankless model that is twice as efficient (we need as much efficiency in our old house as we can get!). Being new and fancy also means that it is a sensitive piece of technology. About five times now we have lost hot water with a morning shower. Because it is a tankless "on demand" system - it happens fast. Let me just say, I am not a fan. When it happens you have to "reset" the system in the cellar. With visits from the plumbers and the gas company, we think we have figured out that it has to do with a drop in gas pressure - but we have been unable to duplicate the problem with experiments during the day. Our current theory, after all this, is that it is the nearby coffee company firing up its roasters early weekday mornings that causes a drop big enough and only at that regular time. *Sigh* That means we may never be able to fix the problem. We can wire a remote to the system and mount it in the bathroom - that way if it happens, you don't have to go naked and dripping to the cellar. I took this picture a few days ago. So it is a little behind - I finished grafting the stitches on the first sock, so it is totally done, and I just turned the heel on sock number two. I am trying to finish these up so I can continue work on what I am calling my camouflage socks (I originally thought there was more green and less brown - oh well). 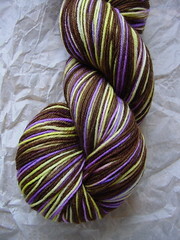 I bought this yarn with a birthday gift certificate with Project Spectrum's April/May color green in mind. I have taken a few pictures for Project Spectrum as well. 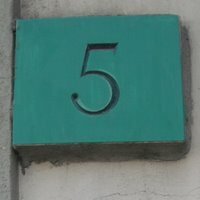 You can see those on Flickr. I was also excited to get my first etsy purchase in the mail. etsy is a online collection of "stores" where people sell handmade goods. 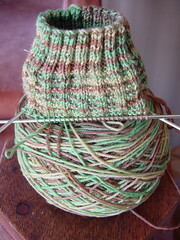 I bought some beautiful sock yarn - the color is called "Mississippi Queen". 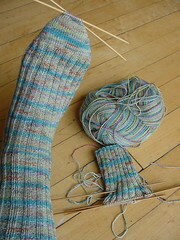 Wow - I love the socks you've been knitting and especially these ones. What exactly is the pattern? Also would you mind telling me what Project Spectrum is please? I come across those words quite often.